Attorney General Jeff Sessions got off to a rocky start. When he recused himself from the Russian collusion investigation, I thought that absurd, but it is done, and it seems the whole thing is backfiring hugely on the Democrats. So it may turn out for the best. Anyway, he recently made an excellent speech. Check it out. 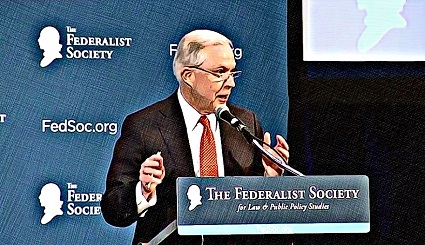 On Friday, November 17, 2017, Attorney General, Jeff Sessions, delivered a rather refreshing speech at the Federalist Society 2017 National Lawyers Convention. Refreshing because it has been a while since the American people have seen Jeff Session in an environment other than before a judiciary or senate hearing where he is warding off attacks from Progressives levying toothless allegations about the proven non-existent Russia narrative for their sake of 30-second clips, talking points and props for next year’s mid-term elections. Jeff Sessions talks about the Trump campaign and victory in 2016, moving on to the President’s accomplishments starting with the appointment of Supreme Court Justice Neil Gorsuch. I wrote him a letter once to ask him if he would be amenable to be traded for our Senator Durbin to represent Illinois. He did not bother to reply and I don’t blame him. The man is no fool.